Campbell Tomato Birth of A Tomato 1956 Ad. 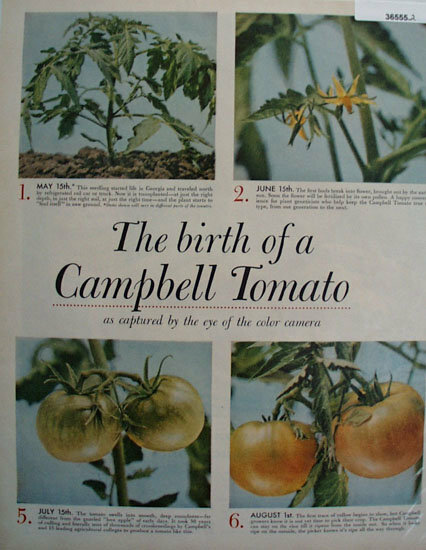 This color two page June 12, 1956 ad states The birth of a Campbell Tomato as captured by the eye of the color Camera. Picture shows month by month how a tomato plant grows. Also shows Campbells Products Tomato Juice and Soup. V8 Vegetable Juice and Franco American Spaghetti. Magazine tear sheet picture is taken through plastic and may show wrinkles or crookedness that is not in the ad. This Original magazine tear sheet measures 10 1/4 inches wide by 13 1/4 inches tall. 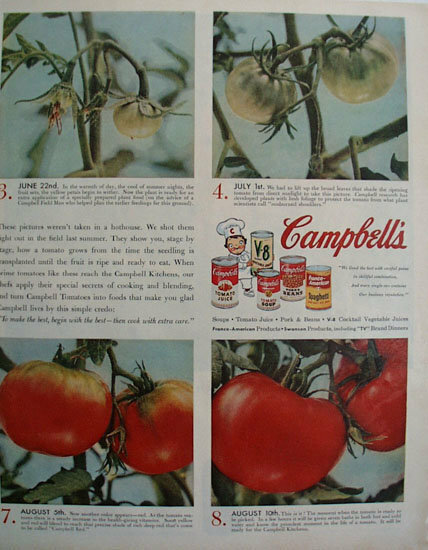 Items Similar To "Campbell Tomato Birth of A Tomato 1956 Ad"